the lela rose spring show was poppy and pretty, featuring swirly prints that swung into shifty, drifty dresses. on the nails was a pretty, matte gray green with the faintest hint of shimmer. 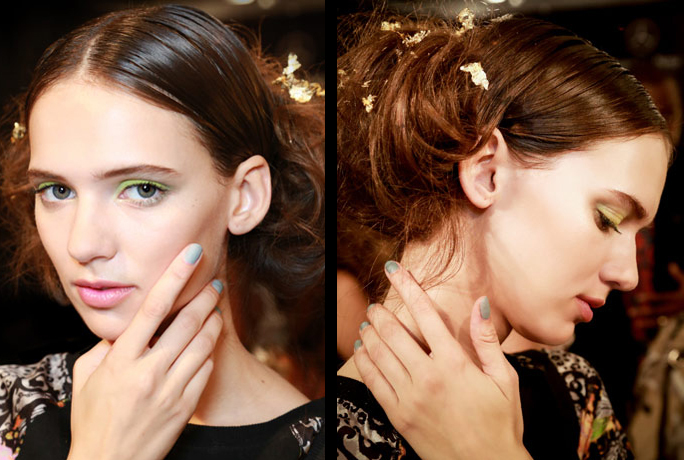 katie jane hughes, for butter london, created two looks for the show: a full matte nail in lady muck, as well as a negative space moon manicure in matte lady muck. i had an accidental run-in with a nail earlier (the travails of an ex nail-biter) that left it a bit uneven, hence my decision to show you only the first look; but scroll through to see the details of the second. to recreate the look, start with two coats of lady muck and add a matte top coat. if you want to buy lady muck, you can find it here.